Several weeks ago, in the thick of election season, Winter Park’s Tree Preservation Board delivered its own October Surprise. The board had proposed significant changes to the city’s Tree Preservation Ordinance earlier this year, and had been waiting for months – through hearings, workshops and citizen testimony — for the changes to be finally approved. But then, in early October something happened that tested the board’s willingness to wait for final Commission approval of the ordinance changes: A local developer filed an appeal, hoping to overturn a $12,375 tree removal fee required by the city’s current ordinance — an appeal that mirrored the Tree Board’s own desire to significantly reduce tree fees and replanting standards. 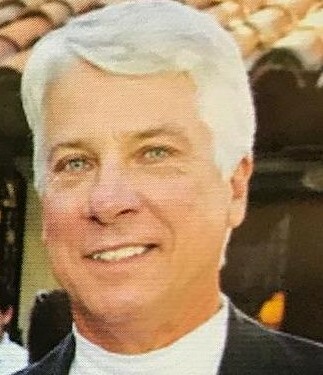 However, documents obtained by the Voice reveal that two weeks before the workshop, Mr. Wiggins’ Code Enforcement department approved a permit application to do just that – remove a healthy live oak – a 39” diameter heritage tree; The same tree that would later be at issue in the October 18 Tree Board appeal. 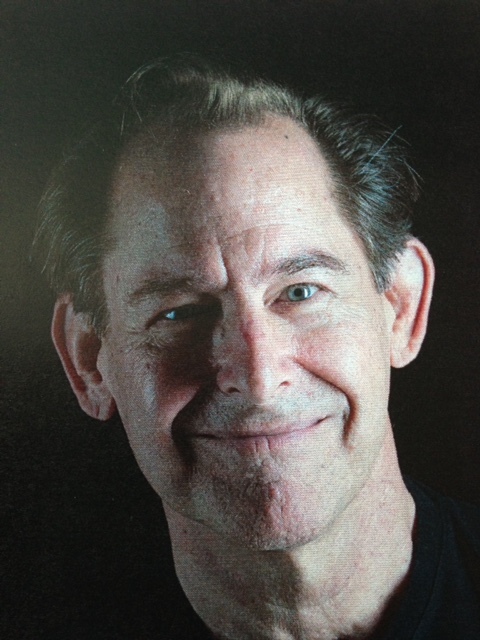 Other documents obtained by the Voice include a Purchase Contract for the residential property on which the oak stands – a lot in an established neighborhood on Rockwood Way in south Winter Park. In an apparent bid to develop an investment property, Rex-Tibbs Construction is contracted as the sole buyer of the Rockwood property. The property contract is scheduled to close in mid-November. Rex-Tibbs submitted building plans to the city indicating that they intend to replace the existing 1600 sq. ft. home on the lot with a new two-story 4,500 sq. ft. home. The new building footprint covers the spot now occupied by the historic oak. Winter Park Voice contacted Donney Rex and requested comment and/or clarification of the information obtained in our Public Records Request. As of press time, Mr. Rex did not respond to our request for comment. Did City Miss Opportunity to Replace Ailing Trees on Winter Park Road? 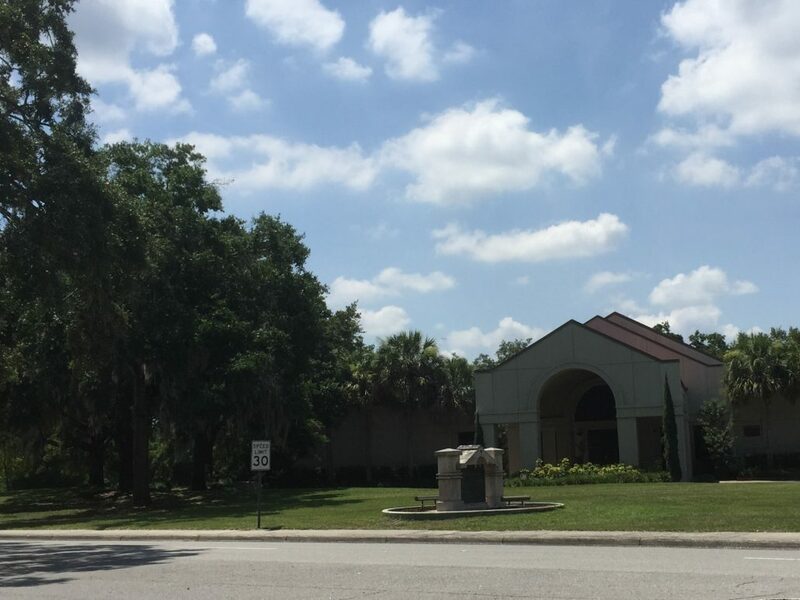 During the hearing, board members learned that the property on Rockwood is very close to Winter Park Road — a few hundred yards from the spot where the city pruned deep v-cuts into multiple oak trees along the roadway. City officials have stated that the trees were pruned this way due to the declining health of the trees. Current city code would have allowed Rex-Tibbs to plant or possibly even “donate” multiple trees as a way to significantly reduce the fee they owed the city. A review of the Rockwood Way documents does not show evidence of any alternative building plans or off-site tree replacement strategies requested by the city or offered by the builder. At the Tree Preservation Board hearing, Donney Rex of Rex-Tibbs construction presented his case to the board members, noting that he has planted many trees during his years as a home builder. Mr. Rex was not opposed to planting a few replacement trees on the property, but did ask the board to waive the $12,375.00 fee. Options including modifying the building plan and/or applying for setback variances to enable the home to be moved away from the tree were not discussed at the hearing. Board members and the city arborist agreed with the builder that the historic tree would have to be removed to enable the proposed new home to be built, as currently designed, inside the current setback envelope. 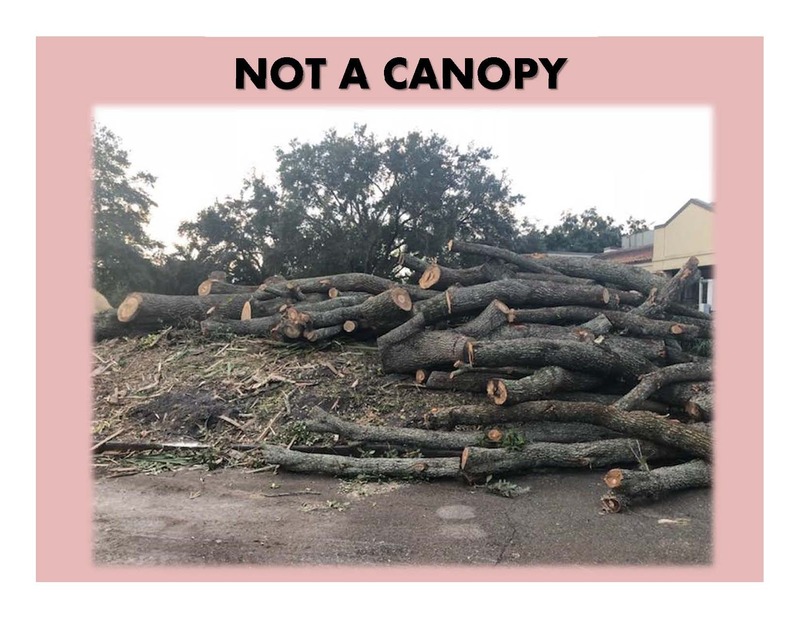 Immediately following Mr. Woodall’s comment, city staff recorded a board vote of “All in Favor” to waive the $12,375.00 fee and require Rex-Tibbs to replace the 39” diameter live oak with two 4.5” trees. “I have no comment regarding the actions taken at the October 18 meeting. The video and minutes speak for themselves. As I am not the chairman of the TPB, it is not my place to speak for the Board. 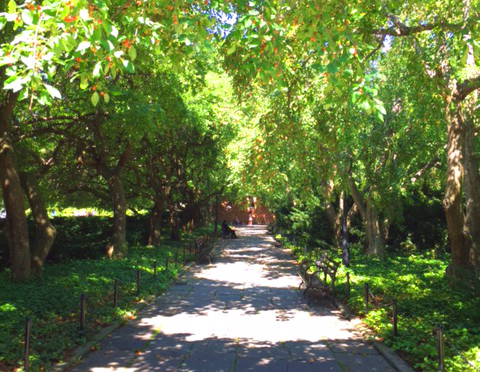 At their September 10 meeting, City Commissioners agreed to put off a vote on Tree Preservation Ordinance changes until a citizen workshop could be convened. The panel acknowledged receiving critical letters from citizens concerned about the proposed changes. The discussion opened old fault lines on the Commission — with the Mayor hinting that citizens had been stirred up by misleading information. Halfway through the discussion, some members of the panel became visibly agitated as they described citizen resistance to proposed policies. Despite the occasionally contentious exchange, the Mayor and Commissioners did ultimately reach consensus that a public forum would benefit the community. City Manager Randy Knight was asked to schedule a workshop on proposed Tree Preservation Ordinance changes. UPDATE: Public Meeting on proposed Tree Ordinance changes will be held Tuesday, Oct. 9 at 6 pm at City Hall. 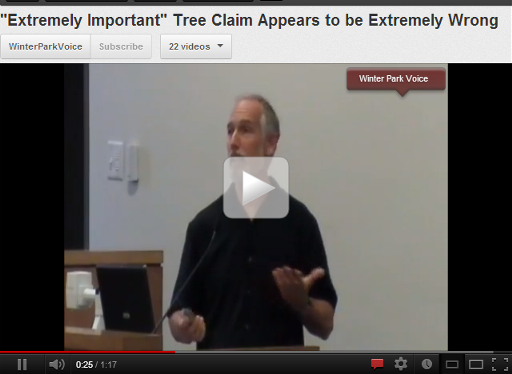 >> Watch video of the discussion by clicking on the image above. On Monday, September 17, Phil Eschbach, a member of the city’s Tree Preservation Board, joined a group of Winter Park residents in a meeting with Randy Knight. The group discussed setting up a workshop, scheduled for October 9, that will give city residents an opportunity to learn more about the city’s proposed changes to the Tree Preservation Ordinance. In a statement to the Voice, Mr. Eschbach said he hopes “for a good turnout on Oct 9th because we want to make sure the public understands what this is all about and what the ramifications are. 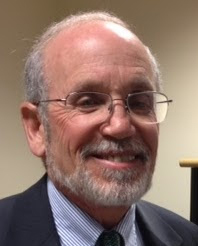 Also the important thing to get across is that after the hearings, the ordinance will be brought up for a vote later in October.” Mr. Eschbach tells the Voice that the October 9 meeting is scheduled for 6:00 pm, pending final confirmation from City Manager, Randy Knight. Marc Hagle, past member of the Tree Preservation Board that wrote the current ordinance, has indicated to members of the citizen group that he will attend the workshop. This article was updated on 9/19/12. In an open letter to city officials and citizens of Winter Park, Marc Hagle sheds light on the original Tree Preservation Ordinance he helped write as chairman of the tree ordinance committee. Mr. Hagle explains the costs and benefits that underlie the current ordinance and urges a more robust, citizen-involved debate before the ordinance is changed. Hagle traces the history of Winter Park’s tree canopy — an effort sustained by generations of Winter Parkers to fulfill a vision of the city’s founders. That vision transformed a landscape dotted with native pines into the urban oak forest we live in today. 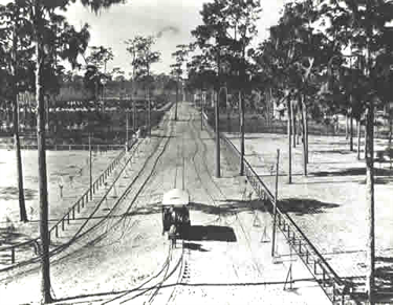 The historic 19th century photo shown above (obtained from the Winter Park Historical Association website) shows the Winter Park/Orlando “Dinky Line” passing by the pine trees that dominated the landscape in the late 1800s. “Thank you to all who have volunteered their time for the benefit of Winter Park. It is through a combined effort and dialogue that a true and representative direction for the City is determined. The tree preservation ordinance is one of those issues which requires an open and representative discussion. There are clearly two schools of thought, the property rights of our citizens and the historic rights of the City. I am a real estate developer. As such, I am firmly in the camp of individual property rights. An owner should and must have the right to own, protect and develop his individual property as he wishes, of course within safety and other realistic guidelines. But what are these guidelines and what is their purpose? Historically, City codes are based on the health, safety and welfare of it citizens and the public in general. How does this apply to the tree line within the City? To answer this question, one must understand the history behind the tree line in Winter Park. 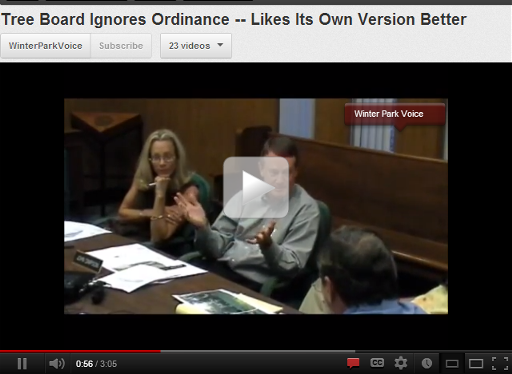 Continued from Home Page… In the late 1800’s there were no oak trees in Winter Park. The trees consisted primarily of pines. The City leaders at that time started importing and planting the oak trees as we see them today. This process continued thru the early 1900’s. The City we enjoy today is a product of over 100 years of effort from our forefathers. Property rights versus the rights of the community, this is today’s debate. The tree line in Winter Park is not a today phenomenon. It is a legacy passed down to us. 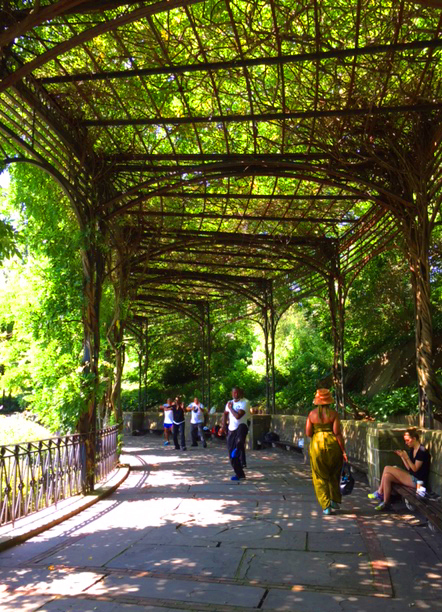 It is part of the very soul of the City. It is not an asset which can be replaced in the short term, as it takes decades to develop a mature tree. Does the history of the tree line and the time to replace it give rise to City intervention? Well of course it does and has by the history and agreed importance of the tree line and the very existence of the previous, existing and proposed tree codes. So now the only remaining question is the degree of intervention. It costs approximately $110 per caliper inch to plant an oak tree. Once planted, a new oak tree must be heavily watered for its first year after planting. To hire a crew on a bulk basis to water newly planted trees costs over $5-700 per tree. The Winter Park Live Oak Fund has planted over 750 trees in Winter Park in the last 5 years. The fund initially planted both 6 inch and 4 1/2 inch trees. In our first year we learned it was most economical to just plant the 4 1/2 inch tree. We also learned an oak tree of less than 4 1/2 inches had no short term impact on the tree line. By dropping to a 3 inch tree, we were not only compromising in diameter of the tree but most importantly the height and spread. Thus the Live Oak Fund, through trial and error, determined a 4 1/2 inch tree was the best for the City and still cost effective. 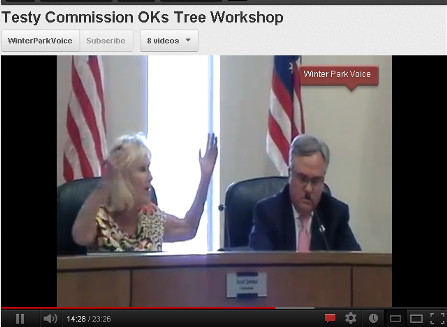 When I chaired the committee which wrote the existing tree ordinance, there was considerable debate as to personal versus public rights and a fair and equitable cost, if you will, as to the value of a tree to the City and the right to buy that value from the citizens of Winter Park. It by no means was a short debate. 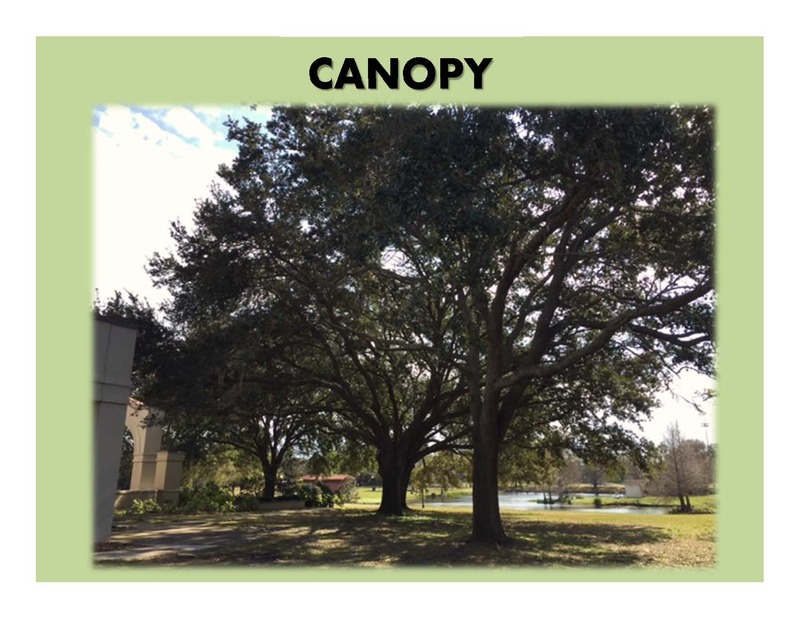 The existing fees were determined based on the size and historic nature of the tree to be removed and a comparison of those costs to ordinances written in the communities surrounding Winter Park. Further, one of the overriding considerations was the long term protection of the tree asset for the City. We did want to allow the property owner the flexibility required, but did not want to allow this flexibility without recognizing the actual replacement cost of such an asset. 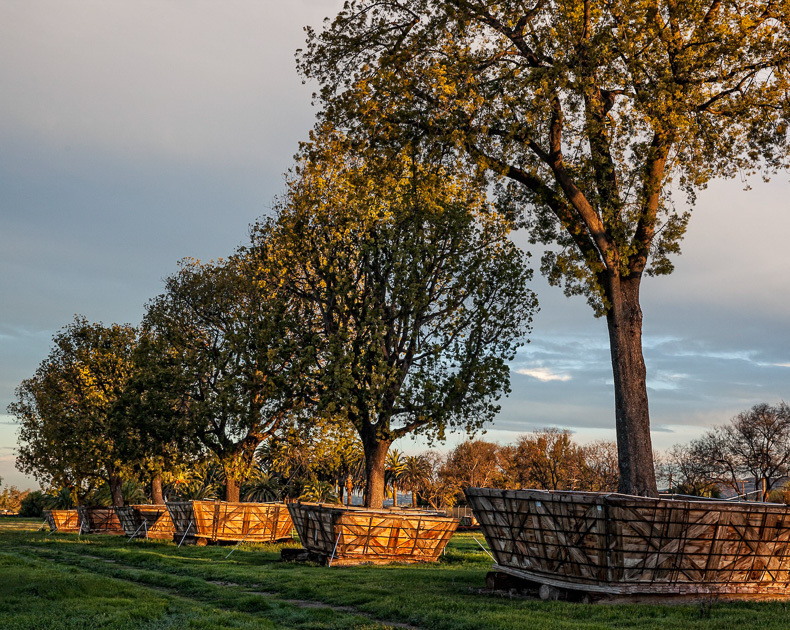 The three categories of trees, protected, specimen and historic are representative of similar ordinances in other cities and recognizes the long time it takes for the growth of an oak tree. The replacement ratios of 1:1, 1.5:1 and 2:1 took the visual impact and replacement time into account. So, should a property owner have the right to remove a 75 year old tree and replace it with 3 five year old trees? From a cost stand point the tree removed costs approximately $20-25,000 and the replacement would cost $990, not a fair trade. From an historic and visual perspective, trimming a deep V for power lines has less impact. We know how the public feels about the power line issue. Will your neighborhood power lines be safely buried underground before next year’s hurricane season? After months of study, city engineers have the answer. The ambitious $70 million undergrounding project — approved unanimously by the City Commission — could span fifteen to twenty years. Electric utility revenues will pay for the undergrounding, which is expected to cost the city close to $4 million annually. Click the button below to see a prioritized master list of all 75 projects and a detailed explanation of the city’s ranking methodology. Readers can use computer keyboard search functions (ctrl F or cmd F) to find particular streets on the list. Continued from Home Page… During the June 11 Commission meeting, when Director Warren introduced his ranking methodology, he purposely refrained from naming any particular neighborhood or street to keep commissioners focused more on the ranking formula and less on the political implications of which neighborhoods will be undergrounded first. This week, Warren named names — and, his release of the full list also highlights which streets are scheduled to have power lines buried in the first years of the project. 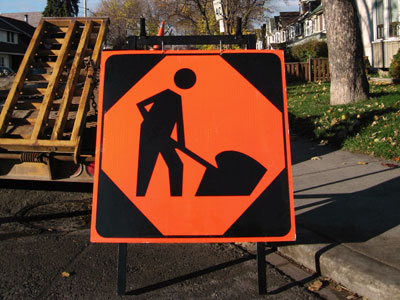 Director Warren is careful to point out that the priority of undergrounding projects can be affected by Public Works projects, unexpected conditions encountered in the field — and by priority changes dictated by the City Commission. So far, commissioners have not tinkered with the methodology, but questions have been raised about high-ranked streets that have already had trees significantly pruned, thereby reducing the likelihood of future power interruptions. City streets with a higher cumulative score are ranked higher and undergrounded sooner.